I, Charley Morton, time traveler and science geek, have set out to record my interview with the great mathematician as part of my "Superheroes of History" project. Love of learning is the most necessary passion . . . in it lies our happiness. It's a sure remedy for what ails us, an unending source of pleasure. Charley Morton: What was life like for you when you were my age? Émilie du Châtelet: I was born into a family of la noblesse. My father lost his post at Court when King Louis XIV died. His successor, Louis XV had no position for mon père; we lost our already meager family income when papa was dismissed from the Court. Charley Morton: How different was life for girls and women back in the day than for men? 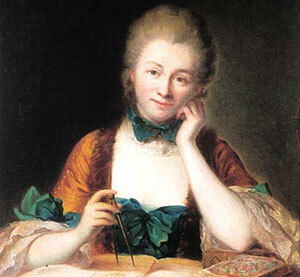 Émilie du Châtelet: Girls were expected to be pretty, ignorant and polite. They learned frivolous activities (useless to me, that is!) like sewing and dancing. I, on the other hand, had a passion to learn about the world. I wanted to know everything! Charley Morton: Yes! Way to go, Em! (Charley jumps in enthusiastically and puts up her hand for a high-five. Émilie frowns. Embarrassed, Charley brushes her hands together briskly, as if to rub off crumbs, then sits on them). Um, er, sorry. I mean, please continue. Émilie du Châtelet: Eh, bien, I was fortunate: Papa recognized early on that I was smarter than my older brother. He brought home books and hired tutors for me. Maman wanted to marry me off to someone of high rank when I was 16 or 17. When I protested, she tried to send me away to a convent school—the only socially acceptable option at the time for a girl of high birth. To me, to be sent away to school with the nuns would have been a fate worse than death—I believed, along with Leibniz, that God was the Prime Mover of the Universe—a sort of force that set all things in motion. That is the only rational understanding for God. So, you see, I knew too much of the new science to go along with strict Church teachings. By that time, though, I already knew more than the tutors, and Papa could no longer afford to buy me books. I could not stop my pursuit of knowledge, though. I went out and earned money for my own books: I learned to gamble with men at the Court of King Louis XV. I learned to duel. I became good enough at fencing to beat the duel master at Court when others bet on my losing. Charley Morton: But... if you had been able to go to a real school? Émilie du Châtelet: If I were king, I would redress an abuse which cuts back as it were, one half of human-kind. I would have women participate in all human rights, especially those of the mind. Charley Morton: You accomplished SOOO much in your lifetime in a time women couldn't make their own decisions, or do what they wanted. Career. Family. Social status. Studying. Writing. Even acting with the great philosopher and playwright Voltaire. Is that what drove you? Émilie du Châtelet: Franchement, I was determined to get everything done. 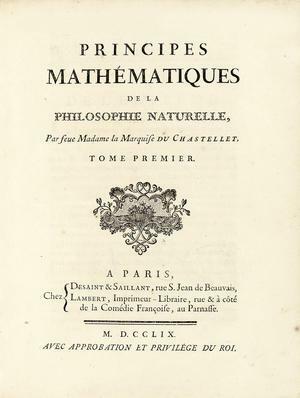 I took on as my mission to complete my greatest work, a French translation and commentary on Sir Isaac Newton's groundbreaking, Mathematical Principles of Natural Science, before the birth of my fourth child. I pushed myself to have enough time in my day for all the study, writing and conversations with scholars I needed to accomplish my life's work. Long hours from midnight until 5 a.m., and then again from 8 or 9 until 3 in the afternoon, to break for un petit rafraichissement, then back to work until 10 pm or so, when I finally retired to dinner. I was in my 40s, you see, and I did this despite being well into my pregnancy, amid fear for my own health and that of my unborn child—not to mention my three other children—lest I lose all the fruit of my work. But, alas, for women in my time, dying in childbirth was shockingly, despairingly common. Charley Morton: Wow. I think you're a hero for all that! Émilie du Châtelet: What I consider my greatest contribution, however, was in mathematics. My work—to determine that Newton did not quite have his equations on the energy of a moving object correct in relation to mass and velocity. Newton said that energy was proportional to a moving object's mass and velocity, or F=mv. I was able to demonstrate that energy was actually proportional to the square of the velocity, or F=mv2. Charley Morton: Yikes! That mathematical breakthrough sounds as if it might have inspired physicist Albert Einstein's famous Theory of Relativity almost 200 years later, where he found E=mc2, or energy equals mass times the speed of light squared. Émilie du Châtelet: (bows her head in acknowledgement.) I know nothing of light's speed, but I am grateful to have laid the foundations. Charley Morton: But what's weird is no one in my time knows about your contributions! If you had been a man, you might have been remembered in your own right, not just as a "friend" of the great writer Voltaire. Émilie du Châtelet: Alas. That is true. But you, my dear child, you will have the opportunity to do whatever you can dream! Émilie du Châtelet: Let us choose for ourselves our path in life, and let us try to line that path with flowers. Charley Morton: That is my great wish, too, Madame. Choosing my own path and enjoying whatever happens along the way! Merci beaucoup for talking with me! Alic, Margaret. Hypatia's Heritage: A History of Women in Science from Antiquity through the Nineteenth Century. Boston: Beacon, 1986. Print. Bodanis, David. Passionate Minds: The Great Love Affair of the Enlightenment, Featuring the Scientist Emilie Du Chatelet, the Poet Voltaire, Sword Fights, Book Burnings, Assorted Kings, Seditious Verse, and the Birth of the Modern World. New York: Crown, 2006. Print. Chatelet. Chatelet. Web. 24 Apr 2016. Emilie Du Châtelet. Emilie Du Chatelet. Web. 24 Apr 2016. Gabrielle Emilie Le Tonnelier De Breteuil Du Chatelet - and Voltaire. Gabrielle Emilie Le Tonnelier De Breteuil Du Chatelet - and Voltaire. Web. 24 Apr 2016. Mitford, Nancy. Voltaire in Love. New York: Harper, 1957. Print. Zinsser, Judith P. Emilie Du Châtelet: Daring Genius of the Enlightenment. New York, NY: Penguin, 2007. Print. Duelist, gambler, scientist, mathmetician, actress, and mother - just to name a few. Émilie really did do it all! Eighteenth-century France under King Louis XV was a highly stratified society—royalty or noblemen would not associate with the "peasant" classes, except in the role of servants or tradesmen. Girls whose families had high rank in the nobility would have been expected to marry "well"—marry rich, and marry early.